Should I consider the Orthodox Church? The choice of Christian denominations today is bewildering. According to a recent survey there are no less than 34,000 separate Christian groups in the world. Over half of them are independent churches that are not interested in linking with the major denominations. In this sea of Christian disunity can we truly say that there is one Church that should command our attention above all others? Such a claim might seem preposterous and self serving, yet, if it could be shown to be true, might that not be the most important question for a Christian or an enquirer seeking out the "right" church? Will the true Church please stand up?! Is it possible then that there might be one true Church? How should we look at that question? Some people say that there cannot possibly be one true Church with so many denominations around and God working in many if not all of them. There is a fundamental misunderstanding involved here. Supposing that there is one true Church does NOT mean that all the other churches are of no account, unworthy, unsound or unblessed. Far from it; God is merciful and compassionate and the Orthodox view is that heaven will be full of many surprises for Christians with tunnel vision. However, why is it an absurd notion that God might have preserved the FULLNESS of His Church in one identifiable, visible global community? It seems much more consistent with God's care and love that he should have made that provision for humankind. He certainly did so in Israel before Christ. There was only ever one "Israel of God" and that was an identifiable visible community. This does not prove the matter for the Church after Christ but it does open up the question as a reasonable one to ask if only because there should be continuity and consistency here from the Old Testament to the New. If such a God provided fullness were to exist in one true Church, what would be its characteristic marks? How might that Church be recognised? The formula that all Christians have followed in that it neatly summarises so much of New Testament doctrine concerning the Church is that she is One, Holy, Catholic and Apostolic. So what do these mean and what evidence is there that the Orthodox Church bears these marks of true greatness to the point we could say that: "yes, this is the one true Church of old, for ever new"? Our Lord Jesus Christ's blueprint for His Church is substantially laid down in John 17. It is here, at the end of his earthly ministry, that he commits his Presence and His Mission to the disciples, soon-to-be-apostles. Their unity is a brotherhood with none having pre-eminent place. It is a unity reflecting the unity of Father and Son in the Holy Spirit. It is a visible unity but not a mere institutional unity. The unity of which we speak is a witness to the world of the sending of Christ to the world and the good news that He brought. Unity is implicated in the very act of Mission, the Church's essential life. The Orthodox Church is One Church but her unity is not based on a single Christian leader, denominational or papal. Her unity is associational, a fellowship in the Holy Spirit. However, this unity is no mere symbol or ecumenical aspiration. It is a practical expression of love in the body of Christ that respects totally and utterly local culture and even nationhood without compromising the primary international and multicultural allegiance to God, the Father of all. It seems to us that the unity of Christ's Church is neither centralised (we have no Pope) nor is it expressed through independence or invisible bonds. 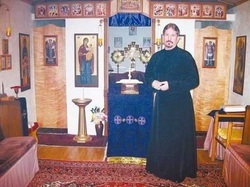 A Japanese Orthodox Christian visiting a Greek Orthodox Church in South Africa would feel utterly at home. St. Theodore of Tarsus, a Greek, experienced no spiritual "jet-lag" when he became Archbishop of Canterbury in 668 AD. St. John Maximovitch, a Russian, felt equally at home as a bishop in both Shanghai and San Francisco. The fundamental biblical meaning of "holy" is "set apart." This is the clear sense of holiness in John 17 where our Lord recognises that his friends will necessarily be set apart from the world whilst being part of it. Such consecration to God inevitably leads to persecution because a Christian's ultimate allegiance is to no man (or woman!) but rather to God alone. Growth in holiness, therefore, is shaped by the cross and driven by the resurrection. The Orthodox Church will have absolutely nothing whatsoever to do with the powers of this world in matters spiritual, according only to human authority that which is legitimate and submitting to its blows where necessary. It is not for the Orthodox Church to claim holiness for itself but rather it is for you, reader, to judge the impact of Orthodox witness over centuries of sustained persecution. The Orthodox Church has ever been the Church of the Martyrs. If the Church is experiencing an easy life ... then she has lost her root and the branches will wither. There have been those who have fallen away from Orthodoxy ... largely through the abuse of power. The Orthodox Church has ever remained firm in its witness and humility before God. Sure, we have our stupid squabbles with each other from time to time. What family doesn't? But on this we are absolutely clear: "God first as a people called to Himself." This much misunderstood word derives from two Greek parts, one meaning "the whole" the other "according to" (difficult to translate!). The meaning of this word is tied in closely with "Orthodox" which means, alternately, true faith or true glory/worship. The formal title of every Orthodox Church is "The Orthodox Catholic Church of ..." So what is signified by the word "catholic" and what has that got to do with John 17 and Orthodoxy? "Wholeness" or "fullness" is the key mark here, ("universal" is a connected idea but usually more associated with "Apostolic.") The Church is Catholic because she leaves nothing out and adds nothing. That which she has received from God ... his words in faith and worship ... she receives, faithfully lives out and hands down from generation to generation. Being committed to "wholeness / fullness," she is steered by the Holy Spirit and by no human hand. The Spirit leads to a fuller understanding of the counsels of God who is not in the habit of changing his mind. It is the People of God, however, who need to refine their hearing and plumb the depths of His Wisdom and Love. In John 17 it is the word Christ received from the Father that he entrusts to his friends ... to keep and obey. Such is the nature of catholicity. It is a fidelity to revelation mediated through the Church; she who keeps the Word of God. If the Orthodox Church has a boast it is that she has neither left anything out nor added anything to the counsels of God. Her evidence for such an astonishing claim lies in the very process of her decision making which from the Acts of the Apostles onwards have always been "in Council." (Acts 15). Truth cannot come out of division because Truth is an expression of Love. Fidelity to Christ and a commitment to the Body of Christ has, in our view, preserved the Orthodox Church from novel doctrines, heresies and unchristian practice by virtue of our insistence on consensus and debate. No one part of the Body of Christ (or individual) is allowed to exert itself over any other part. Patience, listening and dialogue characterise our search for truth and our preservation of truth. Such dialogue embraces the whole global Orthodox Church. Wholeness in doctrine and worship can only be built upon unity and consensus. Self restraint and fearless exploration together are not opposites but mutually balancing mechanisms. In this way, the Orthodox Church maintains the fullness of her faith and life without distortion whilst always being open to what God has to offer by His Spirit today and tomorrow. This process, steered by the Holy Spirit, is what the Orthodox call Holy Tradition. Tradition includes Scripture as its normative core but extends also to the fathers of the Church, the creeds, the life of the saints and even Christian art (iconography). This seamless whole, controlled by Scripture in the mind of the Church is what gives Orthodoxy its enduring coherence; its catholicity. The root meaning of "apostle" in Greek means to be "sent." The Church is Apostolic because she is sent into the whole world. The gospel is a universal message and life for all peoples. "Apostolic" is a word that embraces all the other three words we have considered so far ... one, holy and catholic. The apostolic message and life is maintained by this continuity. Its guarantee is in the Apostolic Succession, so-called. Those who were first sent, the apostles and equal-to-the-apostles, (which includes such Christian apostolic women as Sts. Mary Magdalene and Nina of Georgia), constitute our living link with the faith of our fathers and mothers who were sent out by the Holy Spirit into the whole world to preach and live out the gospel. If there has been any historical breach in this Apostolic Succession, either in faith or the ministerial order of the Church, history has shown us just how much can, did and does go wrong. The existence of over 34,000 Christian denominations today is a sad testimony to that fact. The Orthodox Church has avoided such tragic deformations and divisions by staying within that living and life-giving stream which is Tradition. She is One, she is Holy, she is Catholic ... therefore she is Apostolic. What might I do next? Christianity is neither abstract nor theoretical. It is not lived by reading books, no matter how useful that might be, (and it is useful, indeed, vital for the Scriptures and the Fathers). Christianity has to be experienced and lived "in communion" which means, in the Body of Christ to use St. Paul's memorable phrase, the Church. If you are interested in pursuing your search and exploration further then you need to make contact with an Orthodox Church, preferably one that uses your native language in its services. There are many more of these around nowadays but not often well known. I want to encourage you to contact me (or some other person) to help you. Perhaps we can help you meet someone who will be a friend and introduce you to the Orthodox Christian community; that is, show you what to expect and help you on your ongoing journey. Please don't hesitate. You have nothing to lose and a lot to gain. No. We're most definitely Christians. Oh, then, you're Orthodox Presbyterians? No. We're neither Protestant nor Roman Catholic. Oh, you mean like "Eastern Orthodox"? Yes, except that we Americans are very much in and of "the West." The "west" was itself Orthodox in the first Millennium. Is that like "Greek Orthodox" and "Russian Orthodox"? Yes, but… The Orthodox Church is One Church. Currently, however, Church organization in the west is divided among several different "jurisdictions," or governing bodies of varying national origin within the One Church. The doctrine and worship of each jurisdiction and parish is the same, though in some, languages other than English continues to be used in the services. Orthodox Christianity in a number of ways is quite different from Roman Catholicism and Protestantism. The following questions and answers point out some important points of contrast and similarity. From the Orthodox point of view, Roman Catholicism is a medieval modification of the original Orthodoxy of the Church in Western Europe, and Protestantism is a later attempt to return to the original Faith. To our way of thinking, the Reformation did not go far enough. We respectfully differ with Roman Catholicism on the questions of papal authority, the nature of the church, and a number of other consequent issues. Historically, the Orthodox Church is both "pre-Protestant" and "pre-Roman Catholic" in the sense that many modern Roman Catholic teachings were developed much later in Christian history. The word catholic is a Greek word meaning "having to do with wholeness." We do consider ourselves "Catholic" in that sense of the word, that is, as proclaiming and practicing "the Whole Faith." In fact, the full title of our Church is "The Orthodox Catholic Church." We find that Protestants readily relate to Orthodoxy's emphasis on personal faith and the Scriptures. Roman Catholics easily identify with Orthodoxy's rich liturgical worship and sacramental life. Roman Catholic visitors often comment, "in lots of ways your Liturgy reminds me of our old High Mass." Many of the "polarities" between Protestants and the Roman Communion (i.e., "Word versus Sacrament" or "Faith versus Works") have never arisen in the Orthodox Church. We believe Orthodox theology offers the "western" denominations a way in which apparently opposite differences can be reconciled. 2. Why do you call yourselves "Orthodox"? Orthos means "straight" or "correct." (It is also found in the word "orthopaedics," which in the original Greek means "the correct education of children.") Doxa means at one and the same time "glory," "worship" and "doctrine." So the word orthodox signifies both "proper worship" and "correct doctrine." The Orthodox Church today is identical to the undivided Church in ancient times. The Protestant Reformer Martin Luther once remarked that he believed the pure Faith of primitive Christianity is to be found in the Orthodox Church. In current usage, the words "conservative" and "liberal" indicate a variety of often-conflicting viewpoints. Usually we don't really fit either category very well. On seven major occasions during the first millennium of Christianity the leaders of the worldwide Church, from Britain to Ethiopia, from Spain and Italy to Arabia, met to settle crucial issues of Faith. The Orthodox Church is highly "conservative" in the sense that we have not added to or subtracted from any of the teachings of those seven Ecumenical Councils. But that very "conservatism" often makes us "liberal" in certain questions of civil liberties, social justice and peace. We are very conservative, or rather traditional, in our liturgical worship. A good short answer to this question is "Yes!" The question implies precisely a kind of polarity (i.e., "Bible versus Tradition") which is not found in the Orthodox Christian worldview. Tradition means "that which is handed over." The New Testament carefully distinguishes between "traditions of men" and The Tradition, which is the Faith handed over to us by Christ in the Holy Spirit. That same Faith was believed and practiced several decades before the New Testament Scriptures were set down in writing and given canonical (i.e., official) status. We experience the Tradition as timeless and ever timely, ancient and ever new. We distinguish between The Tradition ("with a capital T") which is the Faith/Practice of the Undivided Church, and traditions ("with a little t") which are local or national customs. Due to changing circumstances, sometimes cherished traditions must be altered or respectfully laid aside for the sake of The Tradition. The New Testament Scriptures are the primary written witness to the Tradition. Orthodox Christians therefore believe the Bible, as the inspired written Word of God, is the heart of the Tradition. In the New Testament all basic Orthodox doctrine and sacramental practice is either specifically set forth, or alluded to as already a practice of the Church in the first century A.D. The Tradition is witnessed to also by the decisions of the Seven Ecumenical Councils, the Nicene Creed, the writings of the Fathers of the Church, by the liturgical worship and iconography of the Church, and in the lives of the Saints. 5. Do you mean you Orthodox believe your elaborate worship is based on the Bible? I'd like to know where. The French Protestant biblical scholar Oscar Cullman demonstrates very convincingly in his little book Early Christian Worship that when John describes heavenly worship in the book of Revelation, he is following the Hebrew custom of portraying Heaven's worship in terms of earthly liturgy. The writers of the Bible thought of earthly worship as a "shadow" or "type" of Heaven's liturgy. (See Isaiah 6, Hebrews 8:4-6.) In other words, a biblical passage such as the fourth and fifth chapters of the Book of Revelation gives us an accurate picture of a very early Christian worship service. That service very much resembles modern Orthodox worship. Orthodox worship is also very Scriptural in the sense that it is a kaleidoscopic mosaic of Scriptural quotations, paraphrases, references, and allusions. It is, quite literally, "to pray the Bible!" Apart from the fact that we worship in English, and use modern harmonies with our ancient melodies, our services are basically identical to those of the early Christian Church. For that reason our worship sometimes seems a bit "strange" to Protestant and Roman Catholic visitors. We often hear, "Your services are just beautiful, and the music is outstanding, but they feel somewhat different." 6. It sounds as if you are rigidly bound by your Tradition. You mean it can't change? 7. Do you have the Virgin Mary, Saints, pray for the dead, and have confession "like the Catholics?" There are points of contact between Orthodox and Roman Catholic belief on these issues, and modern Roman Catholic practice. There are also significant differences. To discuss them in depth is beyond the scope of this short summary. The following is a brief statement of the Orthodox point of view. We likewise honor the other great men and women in the life and history of the Church - patriarchs, prophets, apostles, preachers, evangelists, martyrs, confessors and ascetics - who committed their lives so completely to the Lord, as models of what it means to be fully and deeply Christian. These men and women are called "saints"; a word deriving from the ancient Latin word meaning "holy." For example, we believe that men like the apostle Paul - in their devotion to Christ - led holy lives and that we are indeed to be imitators of him, as he was of Christ. As indicated in John 20:21-23, and James 5:14-16, we practice sacramental confession and absolution of sins. The presbyter (priest) is the sacramental agent of Christ. The priest sacramentally conveys Christ's forgiveness, not his own. 8. Does your church practice "Open Communion?" Icons are not pictures in the sense of naturalistic representations. They are rather stylized and symbolic expressions of divinized humanity. (See II Peter 1:4; I John 3:2.) Icons for the Orthodox are sacramental signs of God's Cloud of Witnesses (Hebrews 12:1). We do not worship icons. Rather, we experience icons as Windows into Heaven. Like the Bible, icons are earthly points of contact with transcendent Reality. In the original Greek of the New Testament Christ is called several times the icon (image) of God the Father. (See II Corinthians 4:4; Colossians 1:15; Hebrews 1:3.) Man himself was originally created to be the icon of God (Genesis 1:27). 10. Isn't all your old-fashioned doctrine and worship a bit irrelevant to modern American life? We believe that God quite literally does exist. He is not a figment of pious fiction or wishful thinking. God and His will is therefore our "top priority." We believe that the Word of God quite literally became Incarnate as Jesus of Nazareth. We believe the Lord Jesus literally rose from the dead in a real though transfigured and glorified physical body. We believe that life apart from God is hollow and meaningless. We notice that people today talk often of "meaningfulness," "the meaning of life," meaningful relationships," "the common good," "the good of humanity," "hope for the future of mankind" and so on. Also, various cults continue to attract many followers in all parts of our land. This indicates to us that people today are hungry for the answers we believe God has revealed through His Word, Who is Jesus Christ. We believe ultimate human values are revealed to us by God, and serve as constant guides in the use of our steadily expanding scientific knowledge. We seek to evaluate technological advances in the light of those basic values. It is our experience that our venerable Liturgy and the ancient Christian doctrines about God and the meaning of human life are just as relevant today as yesterday. These define our basic values. We know the whole ancient Christian Faith as that which makes more sense than anything else in this world of constant change, confusion and conflict. God is the Source of all Meaning; we believe that "mankind's noble ideals" such as truth, beauty, freedom and love, are not "merely ideals," but real characteristics of a real Lord. In and through Christ Jesus, God reveals Himself in human terms and in human terminology as One who is at the same time Trinity of Persons. The word "person" as used in classical Christian theology is not the singular form of "people"; God is not "Three people." Person here means something similar to "I," or "Subject," as in the subject of a sentence. The One God is revealed as having three personal "Centres of Being." God is therefore neither alone nor lonely, for the One Lord is also perfect Communion of Persons. God as Trinity is the model and source of human inter-personal communion and fellowship. Man was created capable of communion (mystical union) with God. Human matrimony is a favourite biblical image of this communion-relationship. Our capacity for divine communion was soon damaged by human error, stubbornness, and evil (i.e., sin). Because of God's infinite love, our potential for communion with God has been restored, renewed, and transfigured by Christ Jesus. Christ communicates His very life to us through His Word and Sacraments. In Christ and the Holy Spirit we can and do experience varying degrees of a mystical union with God now in this life, and on a regular basis. We believe that the purpose of human life is for us to become partakers of the divine nature through the grace of the Holy Spirit, in prayer, sacrament, study of the Word, fasting, self-discipline, and active love for others. All other human projects and purposes, however noble, and important, remain secondary to that, which gives ultimate meaning to human existence. This brief outline of Orthodox Faith necessarily but touches upon a number of more involved issues. If you would like to find out more, we would welcome your inquiries. Orthodox missions are active in Central Africa, Japan Korea and many other parts of the world. For more detailed information please read "Introduction to the Orthodox Church"